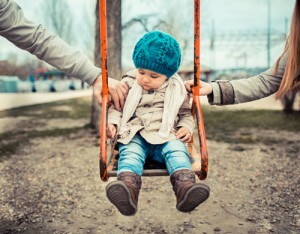 One of the biggest challenges for divorced dads is getting along with their ex. Tension and animosity are practically a given with many divorces. But there are ways to get through it—and possibly even find a way to work together for the kids’ benefit. Doug is a friend of ours at NCF who has been through that situation. His daughter is thirteen now, and for many years things were really hard between him and his daughter’s mom. There were all kinds of drama and stress. I’m sure many other dads in that situation can identify. Doug wasn’t perfect through it all, but he tried to keep his cool and today he says the relationship and the sense of cooperation are getting much better. He offers this insight for dads who might be going through the same thing: Think of your ex like a business partner. What does that mean? I don’t know what line of work you’re in, but let’s think through this. Say you start a business with an acquaintance, and after a few years you start thinking it wasn’t such a good idea. Maybe your personalities clash; the other guy really rubs you the wrong way. Or there are serious decisions you disagree on, and maybe he’s done some things along the way that you consider to be unethical, or simply bad business. The problem is, the way your business arrangement is set up, getting out would cause great loss for both of you. It would be much worse than continuing on with him, no question. You have to move forward; quitting just is not an option. So you try to make the best of it. You look for common ground. Both of you want the business venture to grow and succeed, and for that to happen you have to find a way to work together. Even if he is being totally unreasonable in your eyes, you can probably find a way to put up with him and work on compromises because you want the business to succeed. You can see the obvious parallels. Maybe you and your ex don’t get along. Maybe you feel like there are good reasons to not trust her. I get it. Still, you’re in this arrangement together, and backing out of your children’s lives isn’t an option for either of you. You do have common ground: it’s very important to both of you that your children grow and thrive. And because you both have that bigger goal, you need to focus on that more than your disagreements or other issues and find a way to do your best. Also, if she is your partner, you need her help if you’re going to give your children every chance to reach their full potential. So be respectful as you work toward that goal. And if you find you’re getting angry a lot or feeling walked-on, hold on to the idea that you’re working toward something that’s very important to you. Then maybe you can find the fortitude to bite your tongue, swallow your pride, and go out of your way to make it work. After all, the kids don’t get the best from you or your ex if you’re at each other’s throats all the time. They don’t thrive in that environment. So be her business partner. If you stick with it, you might even develop a kind of “business friendship” for the sake of your children, where there’s more give-and-take on both sides. That’s Doug’s suggestion based on what works for him. What’s your perspective on his idea? Or what other solutions have you come up with to work as a parenting team with your children’s mother? When talking or communicating with your ex-wife, always be respectful. Especially watch your tone of voice. When talking about your ex-wife to the kids, do all you can to stay positive, even if that’s the last thing you feel toward her or you can’t come up with an explanation for her actions that’s very positive. Carey Casey is the CEO of the National Center for Fathering (NCF), as well as a husband, father, and grandfather. He is author of Championship Fathering and general editor of The 21-Day Dad’s Challenge. See more about Carey here.